THE BOOK: The River’s Memory. 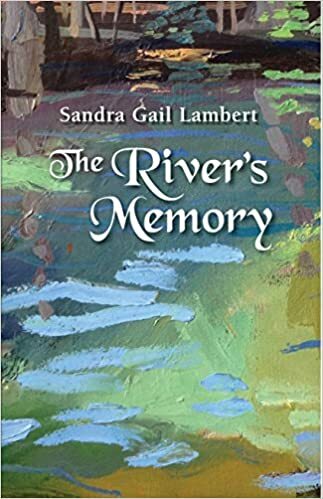 THE AUTHOR: Sandra Gail Lambert. THE PUBLISHER: Twisted Road Publications. Twisted Road is a traditional independent literary press whose goal is to bring marginalized voices into the mainstream. SUMMARY: A woman born without legs spends her days swimming with manatees. Two artists, separated by centuries, guide each other’s hands. A child of the Florida frontier sits on the graves of her siblings to think about race relations and the habits of caterpillars. These are some of the women who live along the banks of a river where water billows from caverns of silent lakes. None of them are famous. None have children. Instead, their stories exist in a mosaic of time and shadowed history, and the things of the river—clay and water, trees and bone—carry their memories forward. THE BACK STORY: My mother was dying. But that’s just one of the “points of origin” for this novel. Another was a boat trip I took in the Okefenokee Swamp where the ranger said that the five cypress trees in front of us (three alive and two dead) were called the “Five Sisters” because of five sisters who used to live in the swamp. Three of them had children but for the two that didn’t, their heritage had died with them. The anger that raged through me that anyone would think that children were the only meaning a woman could offer the world eventually led to the structure of The River’s Memory. But back to my mother. She wasn’t actually dying as I wrote the novel, but some corner had been turned where the awareness of the possibility took hold inside me. I became obsessed with death and its rituals both modern and ancient. Not much of that research made it into the novel, but a lot of characters do die. And I ended up researching Florida from prehistoric times to the present and what I hope ended up infusing the novel is the power of a specific geographic space, in this case the river, has in holding and creating our legacies. WHY THIS TITLE? Sometimes people say that the title should be the poetic summary of the novel. I don’t quite know if we accomplished this, but I do like the double meaning of a river being remembered and a river having a memory. And, of course, it makes the point of the river being a central character. WHY WOULD SOMEONE WANT TO READ IT? There’s a way a novel can preserve history, especially the history of women, especially of marginalized people, that would otherwise have been lost to us. The characters in The River’s Memory such as a scarily depressed women who has given birth to so many babies that have then died, a man escaped from slavery who lives a quiet, dangerous life on the Florida Frontier, a disabled woman who lets manatees teach her how to swim, a girl just on the edge of womanhood who escapes a juvenile prison, or a boat mechanic with a fluid sense of gender —I know these type of people existed. They were people who yearned, for knowledge, for safety, for adventure, and some just plain yearned in that lusty way, but their lives are lost to a formal historian because, of course, no facts exist. But a fiction writer can believe in their existence and write their lives back into history. A novel might offer an otherwise absent emotional truth of an era. This, I hope, is what I’ve managed to do. “The writing—over and over again—is beautiful, transcendent, and engaging.” – Connie May Fowler, author of Before Women Had Wings. AUTHOR PROFILE: I’m a sixty-two-year-old debut novelist. But I have always believed in books. I would sneak the latest Nancy Drew open inside my elementary school math text (which explains my shaky division skills), read through whole libraries, and ended up running a feminist bookstore for most of a decade. But I was well into my forties before I thought of myself as a writer. I’d grown up a military brat, which meant that I lived a lot of places, but most of my childhood, except for a stint at the Warm Springs Polio Foundation, was spent in Norway. And it wasn’t until I moved to Florida later in life that I found a sense of geographic home again. At the same time I was switching out my braces and crutches for a wheelchair and figuring out how to pace my life differently. I think this combination of an immersion in the natural world along with the changes in my body led me towards a more serious writing life. I spent the next twenty years figuring out how be a writer. That continues to be my goal—what is the next thing I can learn to make my writing better? These days I write fiction and memoir, and my work has received Pushcart and “Best of the Net” nominations. Among the places it’s been published are New Letters, Brevity, the North American Review, Water~Stone, and The Weekly Rumpus as well as a variety of anthologies. Excerpts from The River’s Memory, have won awards from Big Fiction Magazine and the Saints and Sinners Short Fiction Contest. “Manatees taught me how to swim. Everyone should have such good teachers. Our bodies aren’t dissimilar—round, thick, born with no legs the same as me. Every year they, even the babies, swim from the ocean and up the rivers, one hundred and sixty two miles of rivers according to my study of Father’s World Atlas. The manatees use their paddled tails, but my arms reach longer and flex more. It seemed reasonable that I, even with my body, should learn to, at the very least, float in an eddy. The manatees don’t come here in the summer. Right now they’re in the Atlantic Ocean eating kelp and scaring fishermen as they snort to the surface, fishermen who will report that they saw a mermaid. But still, I lie on my back in the water, drop deep into the river, and pretend that I’m resting beside them. White sand puffs into the current wherever I touch the bottom. The eel grass slides into my hair, wraps under my arms, and tickles along my back and into the folds of my body. The trees that hang over the river glaze above me. If I would ever let my breath go, I could stay here forever. But I don’t. I never do. The reasons not to change, but today’s reason is that I want a drink. My lungs ache in a final way. I race to the surface and gasp for air. The rum is in the boat. I swim towards shore until my hands can touch bottom. They pull me through the stalks of pickerel weed going to seed. Dragonflies are disturbed into the air. Black wings with flashes of smoky red, and needle-sized sparks of blue dip and soar around me. Adding to my list of books I want to read.